These beautiful flower bulb favors can be made with just a quick trip to your local nursery. This project is from the book Great Wedding Parties (Leisure Arts Book #15748). You will find more creative favor ideas in our books Favors (Leisure Arts Book #3390) and Creative Wedding Keepsakes (Leisure Arts Book #15904). Purchase paperwhite Narcissus bulbs at your favorite nursery. These wonderfully fragrant bulbs are available from September to January. The varieties Ziva and Galilee are the most reliable. Place bulb in the terra cotta pot and cover with the saucer turned upside-down. As though you are wrapping a package, use the ribbon to tie the pot and saucer together, finishing with a bow on top. Slip a fresh or silk flower under the bow. Store in a cool, dry place until the party. 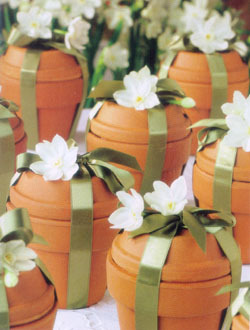 To prepare your paperwhite for blooming, remove the ribbon and place the saucer below the pot. Fill the bottom of the pot with 1/4" of potting soil. Place the bulb on top then sprinkle more soil around it. Tap gently to settle the soil. Up to half of the bulb can be exposed. Put in a cool, sunny place indoors or outdoors in zones 9-10. Water regularly, keeping moist but not soggy. The bulb will bloom in about a month. 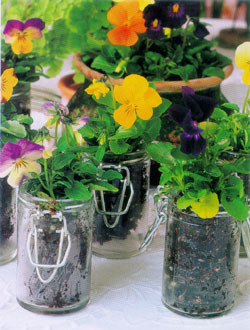 Colorful violas are a garden favorite, perfect for sprucing up any party table. 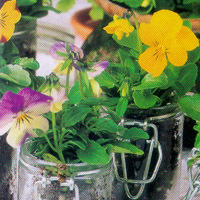 Landscape varieties are available in flats almost year-round and can be transplanted easily into small apothecary jars for guests to take home and enjoy after the party.